As Imam al-Haddad said: "Let us truly take the knowledge of their path from hand to hand until the station of Prophethood." The whole of the Muslim world has joined in grieving over the death of a Qutb of this nation, an Imam of this Qibla: Al-Habib 'Abd al-Qadir bin Ahmad bin 'Abd al-Rahman al-Saqqaf, who was a month short of 100 years old. The appointed hour met him before Fajr on Sunday, 19th Rabi' Thani 1431/4th April 2010. From his home in Jeddah, thousands escorted his body to his residence in Mecca, where prayers were said for him, and he was then taken to the holy sanctuary, the Al Haraam Mosque, where his bier was laid in front of the majestic Ka'ba for janazah, the funeral prayers after the Maghrib prayer, may Allah sheath him with His ample mercy. Eventually, he was lifted by the throng on a wooden bier covered in a green banner. The crowd surged towards the Masa carrying Al-Habib 'Abd al-Qadir aloft and reciting the tahlil with increasing force. Ten thousand people had arrived to say their final farewell to Al-Habib, and as one looked ahead, one could see the green banner of Al-Habib 'Abd al-Qadir. It seemed as if in all his splendour, he was leading these thousands of people. He was taken to Hejoun Al Malaa cemetery, his final resting place, near his grandmother Sayyidah Khadijah, and laid to rest in one of the oldest areas of the cemetery. Born in the city of Seyun (Yemen) in Jumadul Akhir of the year 1331 Hijriyyah, he was brought up in the bosom of 'ilm and taqwa and righteousness. His was an absolutely religious upbringing which left a deep mark on his youth and adulthood. His mother was the noble Sayyidah Alawiya, from the family of al-Haddad. 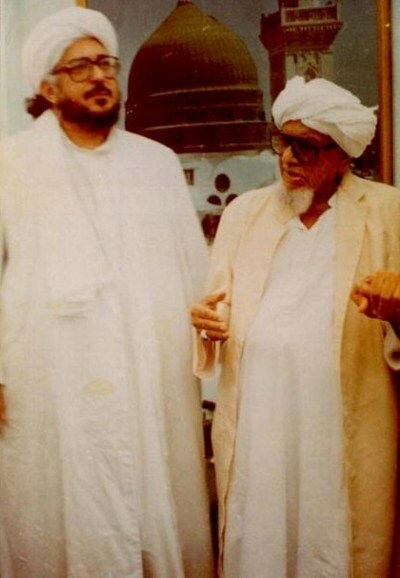 His father was the virtuous Sayyid Habib Ahmad bin Abdur Rahman Al Saqqaf, the Imam of his time, the noble Sayyid, the generous scholar, the worshipper who had reached the ranks of suluk and ascension to the highest levels of spirituality. Like their forefathers, the As Saadtil al Alawiyyin family has followed a Sufi spiritual path leading to Allah Almighty as shown by the blessed descendants of the Holy Prophet Muhammad (May peace and blessings be upon him) in the Ba'Alawi family from Hadhramaut in Yemen and Hijaz in Saudi Arabia . The noble teachings of the beloved Prophet Muhammad (May peace and blessings be upon him) contained in the Holy Qur'an and Hadith have been handed down from generation to generation, in a link from one spiritual master to another, until they have reached us. The Qutb and Gauth (spiritual pillar) of this Sufi order is al-Faqih al-Muqaddam Muhammad ibn 'Ali Ba'Alawi, a direct descendant of the Noble Prophet Muhammad (May peace and blessings be upon him). Its great luminaries include Qutb Al-Irshad Sayyidina al-Imam 'Abdallah ibn 'Alawi al-Haddad and our own Sheikhs Al-Qutb Al-Habib Ahmad Mash-hur bin Taha al-Haddad, Al-Habib 'Abd al-Qadir Al-Saqqaf, and Al-Sayyid Muhammed bin Alawi Al-Maliki (Allah be pleased with them). 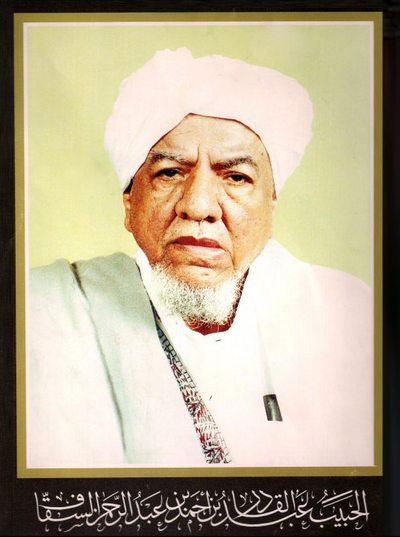 The last was a student of Habib Ahmad Mash-hur and Habib 'Abd al-Qadir Saqqaf. The 'ulama (learned) and the awliyya (saints) in this family have spread Islam in many parts of the world, including the Arab countries, North and East Africa, India and as far as Indonesia, Malaysia, Singapore and Burma. It is narrated on the authority of Abu Huraira that the Messenger of Allah observed: "There have come the people of Yemen; they are tender of hearts, the belief is that of the Yemenites, the understanding (of the faith) is that of the Yemenites and sagacity is that of the Yemenites." It is narrated on the authority of Ibn Mas'ud that the Apostle of Allah (May peace and blessings be upon him) "pointed towards Yemen with his hand and said: Verily Iman [faith] is towards this side." Sayyidina Abd Allah ibn Umar (Allah be pleased with him) narrates that the Messenger of Allah (May peace and blessings be upon him) said: "O Allah! Bless our Sham and our Yemen ." News of the death of Al-Habib 'Abd al-Qadir reverberated in the Islamic world in general, but in the Far East in particular, trailing grief and sadness in its wake. In Indonesia he was its rising moon, indeed the pillar and support of its people. After the passing away of Al-Habib 'Abd al-Qadir's close friend, my Sheikh Murshid Sayyid Al-Habib Ahmad Mash-hur bin Taha al-Haddad, the Alawi teachers and students all took their guidance from Habib 'Abd al-Qadir, as he was the Umeed Al Alawiyyin, their hope and Master. Once, many years ago, I accompanied my Sheikh Habib Ahmad Mash-hur bin Taha al-Haddad to the residence of Al Saqqaf, for a religious gathering. I still remember the moment I took ijaza from Habib 'Abd al-Qadir, as he was one of the greatest awliyya of the age and yet he was so humble and modest, as befits the Prophetic character. I have witnessed Karamat [miracles] of these awliyya which helped me and my family through this difficult world, but which I keep to myself as they are very precious. During my last visit, I sat beside him, and kissed his hand. His eyes were closed; he had aged, he was very weak and he could no longer speak. I remember the magnificent, gentle, patient, vigorous and wise man I had known and I wept, because I did not know if this was my last visit with him. One story about Habib 'Abd al-Qadir involves his Adaab or etiquette; he never said no to people, and should anyone invite him, he would accept the invitation. Once he went to a wedding, and the host walked back to the car with him and he sat in his car and closed the door, as his host kept speaking to him for a while. Then they drove off, and Habib spoke to one of the young Sheikhs in the car, saying, "My finger is caught in the door, can you get out and open the door?" This young Sheikh said, "Habib, why did you not tell me before?" Habib said, "I could not say anything to the host, because he would not have forgiven himself, realising he had closed the door on my finger," and yet Habib kept talking to the host and bearing the pain. On another occasion he was conducting his regular Dars [religious gathering] with the study circle in his house. There were people in his locality who would say ignorant things about him, while he had a regular class that people would attend. Once at the beginning of the class, as he was about to deliver his discourse, a person stood up and started shouting at him, calling him names and otherwise insulting him. Then Habib 'Abd al-Qadir started to make du'a, as if that was the lesson for the day, and he finished the class. He said the Fateh'a and the duas and there was no further response; no anger, no defense of himself. He just left it at that, and said "jazak'Allah khayr that you came and gave us a lesson today, thank you." The person who insulted him was so affected by that, the next time Habib had a class he came back and apologised and kissed Habib's hand, and became one of his students. This is the way these great men of Allah work. In his call to Allah, he became the target of much abuse and harm, but in every situation he only responded by doing that what Allah loved. He harmed and abused nobody in response. He re-lived the way of Imam al-Bukhari, who said: "I hope to leave this life without Allah taking me to account for back-biting a single Muslim." Those who had harmed him in the past would visit him in Jeddah and be treated in the same way as old friends and brothers. He would honour them and fulfil their needs. He said, "If someone comes to me in need I cannot relax until I have done everything I can to fulfil his need. " People known for their hatred of Habib 'Abd al-Qadir and his methodology could not help loving him and becoming his staunch supporters. On numerous occasions, people openly abused him, but never once did he respond or defend himself. He would fulfil the right of every single person; the only right he would ignore was his own. As Allah says: "Repel (evil) with that which is better. Then he who was an enemy to you will be like an intimate friend." Another time, a very rich businessman gave Habib 'Abd al-Qadir a million Saudi riyals, and as soon as he gave it to him, Habib went to his driver and told him to go to a particular apartment where lived a group of widows, to give them this money. He knew exactly the areas and houses where people were poor and needed money. Within a few hours he had distributed it all. He shook the bag to make sure that it was empty and then said: "O Allah, bear witness." He did not go home until he had given away every single riyal. These are the true inheritors of the Prophet Muhammad (May peace and blessings be upon him). Their Ahlaq was incredible; the amount of zikr they would make is incredible. Habib 'Abd al-Qadir was a hafiz of the Qur'an as were his father and his grandfather, every one of his forebears back to the Prophet Muhammad (May peace and blessings be upon him). They all memorised the Qur'an at a young age, and they were all scholars and deeply spiritual masters. They were awliyya. Habib 'Abd al-Qadir had studied 500 books with his father and once someone came into his presence and found so many students around him that the person said, "Habib, I just want one hair, just want one atom of your nur, of the light you have." He said to him, "you cannot bear it; if you get it you will taraq [burn up]." This is the nur of ilm – he had memorised all the books of Hadith of the Prophet; he spent all his life calling people to Allah. When people like this leave this world who can replace them? His was the last generation of masters who never grew up with the internet, television, or movies; they had a level of purity unlike what we have today. In his later years in Jeddah, in spite of his immense amount of work, he would never allow the week to pass without completing a khatm of the Qur'an. This was because the love of the Qur'an had been so deeply infused in him from his childhood. The Ummah is protected by this inheritance, not by the knowledge of modern science. We have no pride in aeroplanes or in technology. Our pride is in men such as this, whose speech, actions, appearance and character point people to Allah. Through taqwa they have the most magnificent of adornment and upon meeting them tranquillity descends. We long for them after they have gone, and our longing for them is in reality longing for Allah, the One who apportions noble character amongst His slaves, just as He apportions material provision. This was how the Companions were, and likewise the Prophets who longed for those who came before them. Allah calls upon His Prophet to remember the previous Prophets, to recall in the Book Ibrahim, to recall in the Book Maryam. Their remembrance is worship. It is a means of approaching Allah and purifying and making firm our hearts: With all that we relate to you of the stories of the Messengers, we make firm your heart. These ties of love and longing reveal the reality of our connection to Allah, built upon our connection to His Prophets, Angels and His chosen ones: Your true protecting friends are only Allah and His Messenger and those that believe, those who establish the prayer and give the Zakat while in a state of submission. The one who takes Allah and His Messenger and those who believe as his protecting friends belongs to the Party of Allah that will certainly triumph. The Ummah is in need to return to this path of connection because by leaving it, the Ummah has been cut off from Allah. Imam Abdallah bin 'Alawi al-Haddad has said: "Fame is not the pattern of Sadat Abi-'Alawi. If any of them likes it, then he is small, i.e. in rank; he will, however, change and dislike it, for this is how Allah educates and refines them. Those among them who are perfect neither seek nor want it. "The more they were raised in (spiritual) ranks and stations, the more they felt that they were the most insignificant of Allah's creation. They took on the best and purest of moral qualities, established themselves in sciences of the outward, and became such that whenever one of them is seen Allah is immediately remembered." The majority of them prefer isolation and dislike prominence and fame. This was indicated by our master Sheikh Abu Bakr Al-'Aydarus, one of the most illustrious and famous, when he said: "Would that we never had known anyone and that none had ever known us, would that we never were, would that we were never born." Some of them preferred humility and an ascetic life, they were those whom "the ignorant thinks wealthy because of their integrity," content with what little they got from dunya (the world), hidden and unknown, their state veiled to the extent of being almost totally imperceptible. Naf'anAllahu bihim: may Allah, The Glorified and the Exalted, make us benefit from all the spiritual masters of the Sadat Abi-'Alawi [Family of the Bani Alawi] and may He raise their high ranks amongst His chosen ones. Ameen.